see how you are sleeping. A few questions you can ask yourself to see if you need a bed would be; “Is my sleeping restless, do I snooze my alarm clock constantly, and am I comfortable when I sleep?” If you answered yes to any of those questions there is a possibility that you may need to consider buying a new mattress. Another common reason why people have their bed removed is that they are old or stained. Then you have a one in a million chance of getting a bed bug infestation. Whether it be your not able to sleep on your mattress, its old and dirty, or its had bed bugs; Vista Clean Junk Removal has your back. When it comes to old, stained and bed bug ridden beds we can remove them for you. Depending on the location of your bed depends on how we remove the item. 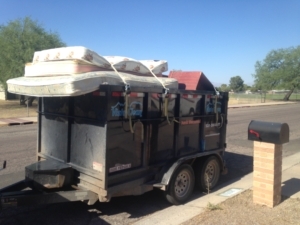 If the bed is outside the home, it is a fast and easy pick up for everyone. If the bed is located inside the home, we place booties on our feet, we will come in with two men to remove the mattress, and leave as if we were never in your home. Some companies have issues with removing mattresses with bed bugs in them, because of the risk involved. One wrong step in the process could spread the bed bugs to the men coming to your home and then spread to their homes and families. We come out wearing hazmat suits to best protect everyone involved with removing infested furniture. When it comes to mattress removal, we offer efficient, quality and on time work.